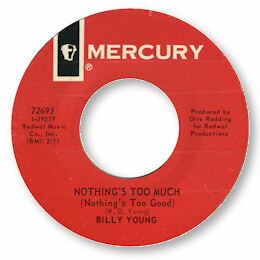 To Otis Redding obsessives – among which I ought to include myself – Billy Young is famous as the artist who initiated the Big O’s own label Jotis that he set up with Atlantic promotion man Joe Galkin. But he was so much more than that – a hugely prolific artist running several labels, a community activist and social reformer whose work is celebrated annually in his adopted home town of Macon, GA.
Young was born in Daingerfield, TX in 1941 moving, like so many from that state, to the West Coast. 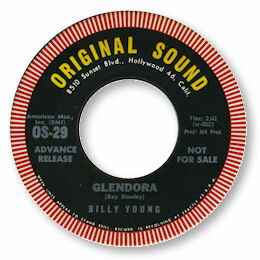 His early recordings were possibly for Crest as a member of the Classics, but the first 45 under his own name was for Original Sound in 1963. On this rather lightweight poppish disc which Northern soul fans seem to enjoy, Billy sings in a high register with a lot of falsetto phrases but when he moved to Macon he fell under the spell of Otis R who had a huge impact on the way he sang – in my view all to the good. Check out his rasping growl on the fine midtempo Same Thing All Over which was cut under Redding’s supervision at Fame. 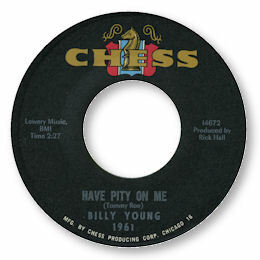 Rick Hall took over the production duties for Young’s only Chess release which coupled arguably the best ever version of the Fame evergreen “You Left The Water Running” with the outstanding deep soul of Tommy Roe’s Have Pity On Me. I think this side may just be Billy’s finest hour, so compelling is his pleading. I love the modulations in the arrangement and the big fat horn section as well. Otis continued to produce Young in Muscle Shoals and, after Jotis closed it’s doors, leased the results out to Mercury. All four sides from these sessions are fantastic southern soul. Naturally I prefer the deep ballads and in Nothing’s Too Much and the old warhorse “Let Them Talk” you get a couple of wonderful examples of the genre. The former is so good in fact it could almost be Redding himself doing the vocals – and praise doesn’t come much higher than that. Otis was a horn section fanatic and this shows on the excellent arrangement here, and the the organ playing is subtly intelligent. Young’s last release from the Golden Age was another scorcher. The self penned I’m Available is a wonderfully delicate country soul ballad with very fine guitar fills and a gently cooing female chorus. The bridge is beautifully judged – a side to listen to time and again. The mid paced flip is mighty fine too. Early in the 70s Young took control of his recording career in Macon starting his own Joyja concern and adding others, notably Grotto, as well, releasing over 20 singles over the next two decades. His production values were of course lower, no doubt to keep costs down, and the quality of the music was variable but throughout this high output one thing remained constant and that was Billy’s wonderful vocal ability. The funk crowd are interested in the rhythmic “Suffering With A Hangover” and in truth it probably is the pick of the tunes he produced in that idiom. 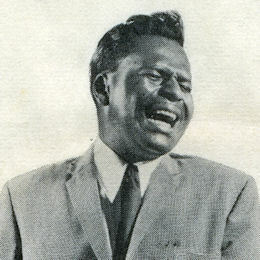 Among the most interesting of the 45s were the two hymns to his home state “Get A Taste Of Georgia” and “All Of Georgia’s Children (Get Homesick)”. The biggest seller was undoubtedly “Country Boy” from 1976 and afterwards he often styled himself Billy “Country Boy” Young. 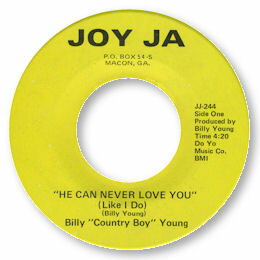 Several of the 45s were ballads of which the pick were “He Can Never Love You (Like I Do)”, Don’t Hang Your Head and the melodic “Still My Life Through”. By the late 70s Young had become heavily involved in his local community, doing volunteer work at a children’s centre for example, and his music began to reflect his new concerns. “Sickle Cell Anemia” (sic) warned of the dangers of this terrible disease, and “Keep His Dream Alive” was issued at the 10th anniversary of Dr Martin Luther King’s assassination. While Young’s Redee 45 was straight forward gospel, the Rane-Bow 45 was overtly political as it was released to help Rev Jesse Jackson’s unsuccessful bid for the Presidency in 1984. 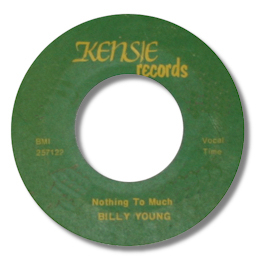 Billy Young sadly passed away on 19th August 1999 but his memory lives on not only in the excellent music he left us but also via the annual Billy Young Memorial Tribute held at the Rosa Jackson Community Centre in Macon where he did such fine work for the children of the area. UPDATE ~ Dave Turner has been in touch about an issue of "Nothings Too Much" on the Kensie label (shown on the right above). Is this the first issue of this great 45 or is it a bootleg - possibly from Holland. Can anybody help? NEW UPDATE ~ Pete Nickols adds "Billy cut the first unissued-at-the-time version of Dan Penn’s “Feed The Flame” at the same 1966 Fame session that produced Young’s version of “You Left The Water Running”. It’s available on the UK Kent 3-CD set “Fame Studios Story 1961-1973” (Kentbox 12)." Pete has kindly reviewd this Kent CD set here. Note - Dating of most of Billy's own productions is impossible apart from the odd 45 with a year printed on it. So releases are shown in label order. Note ~ "Nothing's too much" can be found on the first volume of the Kent UK series of Dave Godin's Deep Soul Treasures. Acknowledgements to Brian Poust (see Links). And thanks to Peter Hoogers, Dave Porter and Naoya Yamauchi for additions to the discography.